At first glance, BRN GRL SPK and GRL TRBL have a lot in common: both brands chose to drop the vowels in their names, are dedicated to inclusive and intersectional feminism, and hope to spark conversation and action among women of color. 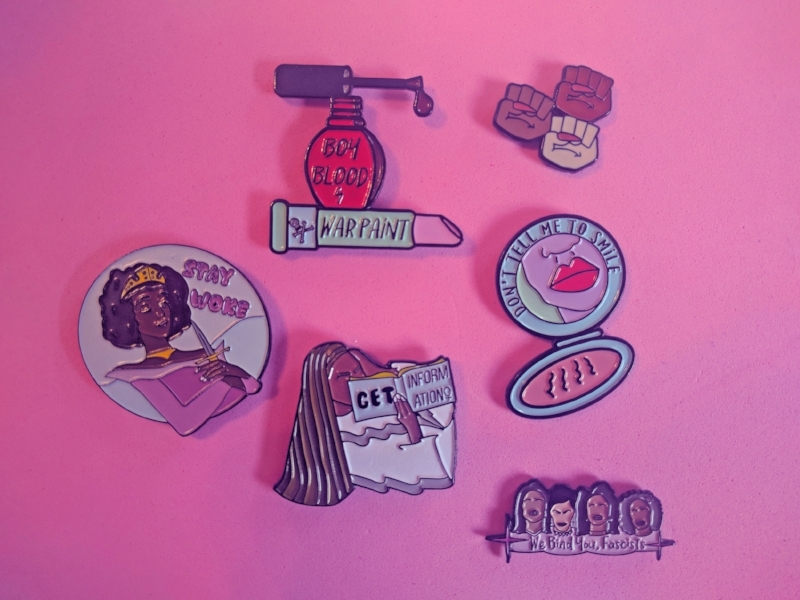 What sets Emerald Pellot, creator of GRL TRBL, apart though is her bold, creative style and her knack for capturing big ideas in small, colorful pins. Emerald started GRL TRBL, an enamel pin and art company, just seven months ago out of frustration with the election and politics. Since then the Bronx-born, Harlem-based writer and illustrator has grown a community of nearly 4,000 people and given them a cool way to express themselves with popular designs like the Get Information pin and the Resting Boss Face pin. She's also collaborated with Wildfang on a clothing and accessory collection. And she's not stopping there. In her constant strive to represent people like her, Emerald is launching a Latinx-themed line of pins this month in collaboration with Krystal Quiles. We talked about where that desire for representation comes from and how Donald Trump (weirdly enough) has pushed her to achieve more. Professionally, I'm a full time writer. I guess I always wanted to be a writer for as long as I can remember. I studied writing at NYU. When you're a kid you imagine yourself writing novels and short stories in a cabin or you imagine yourself as a hard edge investigative journalist, but those aren't realistic or sustainable professions for a writer. I created GRL TRBL because I needed a creative outlet that wasn't writing. When you write 40 hours a week, it's hard to do your own thing but I was feeling so alienated and stressed out from the election that I needed to channel that anger and confusion into something and writing wasn't really working. I'd always used Adobe Photoshop and designed my own blogs, so I thought I could make some kind of digital art. From there I came up with the Solidarity Pin because I had already been buying enamel pins. I shared it on Instagram and it took off from there. How did that turn into GRL TRBL? GRL TRBL is an outlet specifically for my political frustrations, and I realize now that it's also about racial visibility. I'm Afro Latina: Dominican and Puerto Rican. There aren't enough of those voices or they aren't visible enough to find them. My artwork and pins don't directly reflect anything specifically Dominican or Puerto Rican, but it's important to be seen or heard when you're a part of a marginalized group. I really wanted that. I wanted to be seen and I wanted to see other people. GRL TRBL allowed me to find a community of other Black and brown women of color who are trying to do the same thing and trying to find their voices in a world and a political climate that tries so hard to silence them. You've been around for a year now, right? What kind of response have you gotten from people about GRL TRBL? Not even a year! I launched in March 2017. Every once in a while I'll get an alt right weirdo commenting on my stuff, but people have embraced GRL TRBL much more quickly than I though they would, and much more wholeheartedly. It's a testament to putting yourself out there and fearlessly making things and sharing them. I spent so much time second guessing my abilities and not feeling good enough [as a writer.] Because of that, I became sort of inert in my aspirations and in my career. I just stopped writing and being creative in that way. When I decided to become a visual artist, I realized no one expected me to be good so I didn't have to put that pressure on myself. I just started. My line work isn't going to be perfect. My technical skills aren't going to be excellent. It's all new to me. But without that inhibition, I started sharing and posting things and because I didn't put any pressure on myself to be excellent, I was able to have full creative freedom and not worry so much about what people think. What importance do you think your work serves in today's political and social climate? I always find the relationship between capitalism and political ideology interesting. Obviously, feminism is in a strange place where it's more popular than it has been in a long time, but it's also being commodified by corporations that don't live and breathe those values. They slap "Feminist" on a t-shirt and sell it. I really don't want GRL TRBL to be that. Thus far, I've only worked with women and it's been great and rewarding. I've only been trying to occupy spaces that are women-driven. In this climate, it's helped me become a part of a community. Not just online, but in person. That's more essential than ever. Maybe my art can provoke you or push you into thinking about things in a way you hadn't before. The role of art in society is a much larger conversation, but I think it's essential to support artists and women of color who create things. We don't have the same economic power as other groups in the United States. There's something to be said about supporting people of color who make things in order to correct that imbalance. The first time I stumbled upon GRL TRBL, I thought "Yes! This is so needed." Plus I took the fact that our brands' names looked so similar as a sign that a partnership was meant to be. Seriously though, your company is sharing a message that needs to be heard. (LAUGHS) I hope so. I think representation matters. I didn't [used to] think it mattered that much to me and I guess that was because I never felt represented at all. Not just in my ethnicity, but in my personality. I'm a very strange person so it's hard for me to connect to media. Also, there are no Dominican people on TV. There are sometimes, allegedly, Puerto Rican people on TV. If anyone can feel like their voice is heard because it's similar to mine, that's great. I can't be the only weirdo from the Bronx who's angry at the patriarchy, and sassy, and likes the color pink. I hope GRL TRBL helps people know there are others like them, if that makes sense. I certainly feel like I don't fit in, even where I'm from. Having been a misfit in many stages of my life, seeing people connect with my art is really special. What do you want to do next? Where are you trying to go from here? Well, the world's ending (LAUGHS), so I'm just trying to live fearlessly and fully and figure it out. I'm trying to figure out what my life is going to look like not just five or ten years from now, but 30 years from now. What will I be known for if I'm known for anything? Will I still be making art, or writing, or doing something else entirely? Clearly I'm the kind of person who likes to change their passion on a whim! It's hard for me to answer because it's hard for me to see GRL TRBL as a business, like me being a CEO and having employees and reproducing the conditions of society that I hate. I really don't want that. What I really want for the future of GRL TRBL is not to make the most money possible, but to be profitable enough to be of service to the values I care about here in Harlem, or in the Bronx, or on the national level. I say I'm an intersectional feminist and it's easy to say that, but I want to demonstrate it more and show people you can run a business that's instilled with important values and political ideology and still be happy. What is one of the most important lessons you've learned in life so far? I think what the election taught me is that literally nothing matters, so you might as well do what you want. I mean, if you're a psychopath, don't follow that advice. But if you're a kind, empathetic person, you ought to. I made GRL TRBL happen because this monster who is so unqualified to become president became president. If this guy who doesn't even want the job can talk his way to a podium and take it, then I can take the things I want too. This is important for people with Impostor Syndrome. No matter how smart or qualified I am, I always second guess myself. Part of that is from being a misfit growing up, but it's mostly because I'm a woman of color. When you start to navigate the professional world, spaces just get whiter and whiter. I know, or at least get the sense, that White people and White men don't ever wonder if they should be in the rooms they're in. I just need to think like a cisgender, White man and believe I belong in any room I walk into because I'm there. I can do whatever I want if I put in the work, if I figure it out. I'm a writer because I say I'm a writer. I'm an entrepreneur because I say I'm an entrepreneur. I'm an artist because I say I'm an artist. That's how successful people navigate this world. How do you think other women of color relate to that? Women of color demonstratively vote in a way that's very selfless. They often vote and make decisions in a way that benefits the most people, not just themselves. We're lacking an ego and edge, even though we're often called angry black women. We lack the boldness to -- I don't want to say succeed because we do. We're so resilient. But we need to bust some balls, build ourselves up, and live like Kanye and say we're the greatest of all time. We actually have receipts of that. We have the talent, and drive, and charisma, and agency to do the damn thing, but we still often think we can't for no reason other than that message is constantly hidden from us. I've learned to believe anything is possible for me if I will it. There are so many mediocre people who have so much success. All I need to do is be a little bit better than them. I can guarantee we're all so much better because we've always had to be not just twice as good, but ten times as good, to get half as much. I guess I learned a lot from Donald Trump, ironically. I like the idea of brown girls winning. It feels like justice. I think anything that can shine a light on, or give a microphone to, people who aren't typically represented or heard is special and necessary. I think there's this horrible belief that when one group of people is doing well, another group has to suffer. I believe there's enough space to be occupied by all of us. For me, BRN GRL WIN allows us to occupy the space we're being pushed out of even though it's ours. It's not so easy to find women who reflect my values even though I know they're out there. It feels like a constant missed connection. Anything that can be a medium to connect to those people is essential and important and makes us more visible. I think it changes the way we see ourselves and changes what we think we're capable of. You can stay up to date with Emerald and GRL TRBL on Instagram and on her website. Check out our past BRN GRL WIN features.